Its Story Time with the Cookaholic Wife! Come grab a comfy piece of carpet or computer chair and let me share this one with you. We need to go back almost three decades to the year 1987. For those of you youngin’s, this is back when MTV actually played music videos and side pony tails, slouchy socks and neon colors were in style the FIRST time. Now I didn’t participate in many of these trends, seeing as I was only 2 years old. But apparently, I already had developed my sweet tooth. Like any cranky two-year old requires, my mom put me down for a nap and then ended up taking one herself. No, no, I’m not going to tell you the story of the iced tea and smoke alarm, I’ll save that for another time. Anyway, I wake up and find my mom still asleep. And like any good two-year old, I decide a snack is in order. Some time later, my mom wakes up to find me sitting in front of the refrigerator with the door wide open. My hands and fingers and face are stained pink and there is an empty jar of maraschino cherries next to me. I’m also sporting quite the stomachache. Years later, when I was a teenager, my mom and I were somewhere that happened to have the cherries and I commented on how they grossed me out a bit. Which prompted my mom to tell me the story. It also explains why, sometimes, even to this day, the though of eating a maraschino cherry just makes me cringe. I’ve never had a problem with regular cherries though, which is what I intended to use for this months Improv Challenge where we had to make something with cherries and almonds. But the cherries at the grocery store just didn’t look good enough so I had to use the maraschino kind. 1. Preheat the oven to 350. Line a cupcake tin with 12 liners. 2. In the bowl of your stand mixer, beat the butter and sugar together until smooth. Add in the eggs, one at a time until fully incorporated. 3. Combine the flour and baking powder in a small bowl. Alternate adding the flour mixture and the whole milk into the mixer until fully combined. Then add in the almond extract. 4. Fill each portion 2/3 of the way full with the batter. Bake for 20 minutes or until a toothpick inserted in the center comes out clean. 5. Transfer cupcakes to a wire rack and cool for 20-30 minutes. 6. Drain the maraschino cherry juice, reserving 3-4 tbsp. for the frosting. Set 12 cherries with stems aside to top the cupcakes with. Remove the stems from the remaining cherries and chop. 7. Use a pairing knife to cut a circle out of the center of each cupcake. 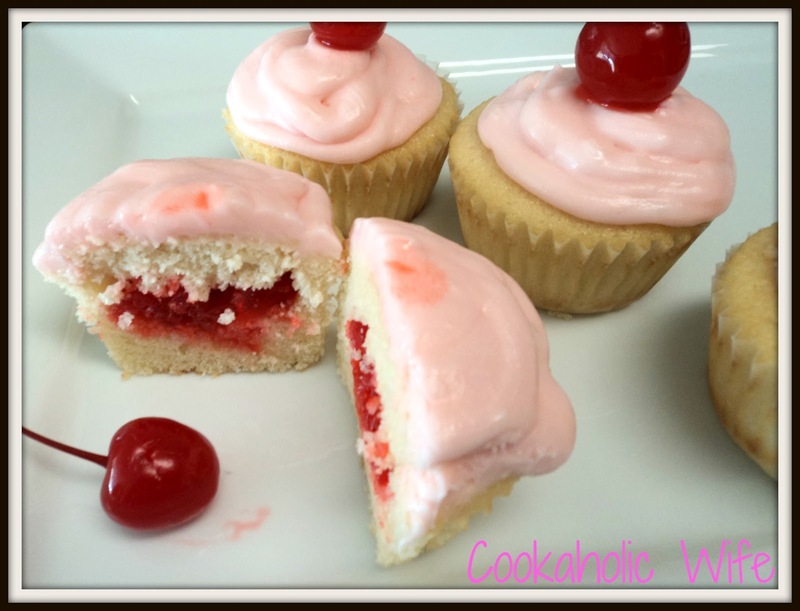 Fill each cupcake with 1/2 – 1 tsp. of the chopped maraschino cherries. Press the removed piece of cupcake on top of the cherries. 1. Beat the butter in the bowl of your stand mixer until smooth. Slowly add in 1 cup of powdered sugar and 1 tbsp. of cherry juice and continue beating until smooth. 2. Repeat until all of the sugar and cherry juice are combined. Add the almond extract and then if the frosting is too thick, add in the milk, a little at a time, until it reaches your desired consistency. 3. Transfer frosting to a large piping bag fitted with a large tip shape of your choice. Pipe the icing onto the cupcakes. Top with the reserved maraschino cherry from the cupcake ingredients. 4. Serve immediately or transfer to the refrigerator to chill until ready to serve. I rarely have any luck with homemade frosting. I can just never get them to the consistency that I want. This frosting ended up too thin and ran a bit when I piped the cupcakes, but its by far the best job I’ve done yet. The stemmed cherry on top of these cupcakes just really, pardon the expression, takes the cake for me. I am SO happy with how these turned out. They also taste amazing! The almond flavor is subtle but comes through and compliments really nicely with the sweetness of the cherries. The frosting is obviously super sweet since its made with 4 cups of powdered sugar, but honestly, I can’t imagine a less sweet frosting really working as well with this cupcake. I think it would get lost among the other flavors. 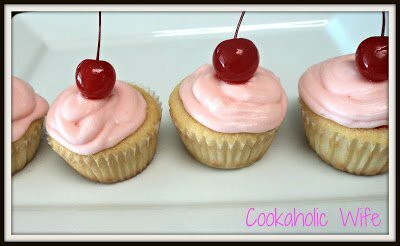 While I may not be cured of my permanent maraschino cherry hangover, I was definitely able to enjoy these cupcakes and I can’t wait for an excuse to make them again! I've actually made these before and they are wonderful!